Nothing excites the public more than finding shipwreck gold. When I was 12, I had a metal detector and entertained dreams of finding some of the buried treasure of Jean Lafitte and other pirates who haunted the bayous of Southwest Louisiana. But there is no ship more famous than the United States Mail Steamship Company’s SS Central America, which in 1857 carried tons of gold worth over $2 million dollars, at $20.67 an ounce, and 38,000 pieces of U.S. mail. Back in September of 1857, major New York banks, business and individuals were eagerly awaiting the arrival of the SS Central America with a large shipment of gold bullion, ingots, nuggets, dust and coins from the San Francisco Mint – the latest output from the massive gold mines of the California Gold Rush. When news came through the telegraph wires that the ship had sunk off the coast of South Carolina, the country went into a panic. It was a time when the country relied on gold to back its banking transactions. Banks closed, businesses went bankrupt and the financial Panic of 1857 deepened – all because the much-awaited Ship of Gold had disappeared with tons of needed gold on board. I was recently in Long Beach, California, examining part of the treasure that was transported on this ship over 160 years ago. There is a sense of excitement whenever sunken treasure is discovered. In March 1992, Life Magazine called the SS Central America “The Greatest Treasure Ever Found.” There were thousands of gold coins on board, struck predominately at the San Francisco Mint, bound for New York. Back in the 1980s, the SS Central America seemed impossible to find in the vast ocean at an unknown location spread over thousands of square miles at depths reaching 7,000 feet below sea level, but the maverick inventor Tommy Thompson and his crew discovered the shipwreck in 1988. What followed were legal battles worthy of a mystery novel. In fact, the book “Ship of Gold” reads like a mystery novel. The full title of the book is “Ship of Gold in the Deep Blue Sea” by Gary Kinder. It tells the gripping story of the ill-fated sailing in 1857, beginning with one ship’s journey from San Francisco to the Isthmus of Panama. Then the gold was unloaded and transported over a 30-mile jungle railroad route to the Atlantic side, to be reloaded into the SS Central America – a 280-foot side-wheeler that had made the Panama to New York run many times. This time, though, the crew had to fight a Category 2 hurricane for three days before abandoning ship. While most women and children were saved, 425 of the 578 on board died. The price of any type of room on the trip was not cheap. A first-cabin ticket cost $300 and steerage accommodations sold for $150. This was rather expensive as the average California gold prospector’s wages were only $5 a day. The captain of the SS Central America, former Naval officer William Lewis Herndon, is remembered as a great leader and hero, going down with the ship, after making sure that most of the women and children were rescued. The Herndon Monument was erected in 1860 at the United States Naval Academy in Annapolis and the city of Herndon, Virginia (site of Dulles Airport near Washington, DC) is named after the captain. 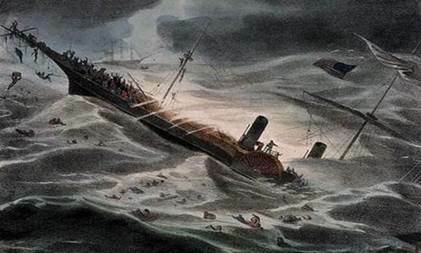 Most of the book “Ship of Gold” describes the fascinating story of Tommy Thompson and the salvage operation that discovered the ship 131 years later. It’s a fascinating story, since there were many other treasure hunters seeking the treasure. In fact, Warner Brothers paid $800,000 for the movie rights to the book. When the book “Ship of Gold” was published in 1998, everyone wondered when some of that gold would go on display or become available to the public. Some initial coins were quickly sold in 2000, but many of us were wondering if we would ever lay eyes on more of this treasure again. Now, finally, more of the ship’s gold treasure was recovered in 2014 and is available to the public from us. This includes some of the gold coins, gold dust and silver coins recovered. It is hard to describe the feeling on seeing this gold for the first time. When treasure hunters first spotted this gold with their long-distance cameras sitting in a mound of glistening gold over a mile below the ocean’s surface, they called it a “Garden of Gold.” Even after 131 years sitting silently on the ocean’s floor, the gold bars and coins were only “lightly covered with sediment,” they said, with sometimes “coral growing right out of a block of gold.” Now that I’ve had a chance to look at these specific coins, I see dozens of specimens that are among the finest known for their date. Each of them is like a little piece of history. You think about who discovered the gold, who held it, who decided to let it go at the last minute. As the famous actor James Earl Jones says, owning money is like “holding history in your hands.” Holding 1850s gold from the California Gold Rush and America’s most famous sunken treasure is like holding a little time capsule of America’s numismatic history in your hands. This time, you and your family can be a part of that history by calling to reserve your piece of the SS Central America treasure before it is quickly gone again. The Wall Street Journal ran an interesting article on the inflation picture last Friday, “Why the Inflation Picture Looks Starkly Different for Businesses and Consumers,” by Sarah Chaney, in which she showed how households don’t see a lot of the inflation happening in America due to the “Amazon effect,” whereby the big online shopping giant is cutting prices for almost everything, thereby undercutting the local shopping malls on a wide variety of consumer products. However, services – like doctor visits, construction or plumbing – comprise 70% of the economy, and they aren’t available on Amazon. The same goes for energy costs, which are rising faster than the Consumer Price Index (CPI) in the last year. Boston’s Fidelity Investments advised investors to look to asset classes that rise because of rising inflation, like commodities and gold. The company also notes that gold and commodities have a long history of posting reliable returns that on average outperform in a rising inflation environment. They point to gold as a store of value compared with paper currencies.